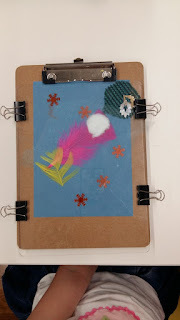 Well life just keeps getting busier, and as a result I don't post things to my blog anymore and have been relying on my facebook page to communicate the arty crafty things I do. So please stay up to date with me this way. I will keep the blog live purely for access to resources. Thanks for your interest. My first ever visit to the Museum of Brisbane located at City Hall, Brisbane City. 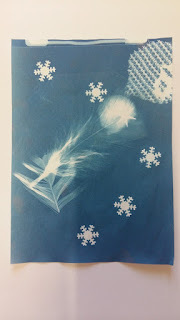 The reason...a children's school holiday workshop, to coincide with Robyn Stacey's exhibition Cloudland. (Cloudland is about the fusion of two images however one is upside down and overlayed transparent). 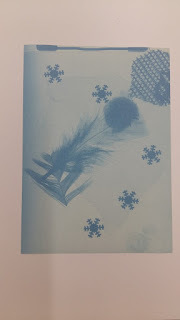 The activity (loosely linked to the exhibition) for children was a sunprints activity; where you use photographic paper and expose objects to the paper using the sun. The idea still related to the exhibition in the sense of photography and transparency. This is a fun activity, inexpensive, and anyone can do it -at home or in the classroom. You could explain to your child about sun safety and how it can demonstrate the use of sun screen. 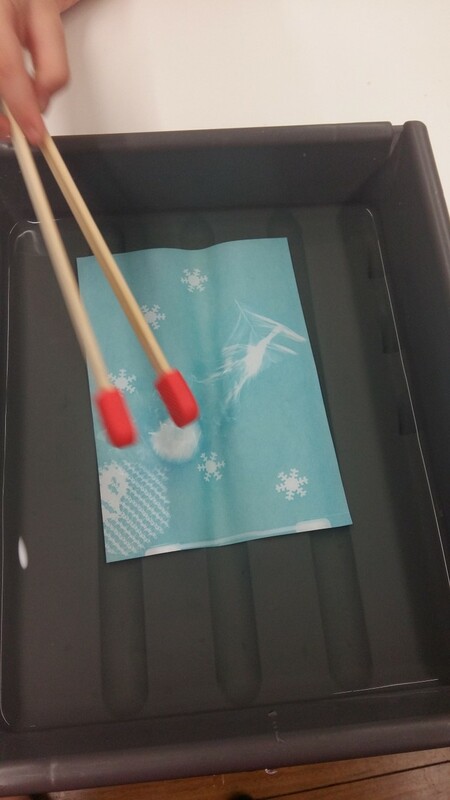 The objects would be the 'sunscreen' and the paper is the 'exposed skin'. The paper (skin) gets burnt when exposed to the sun. When you take the objects away, you can clearly see where the 'skin' has been protected. 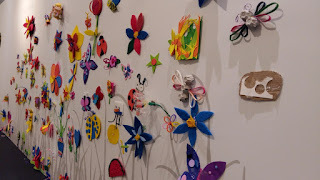 Ipswich Art Gallery, the Children's Gallery, has such wonderful programs. I don't mind the near hour drive there and back to let my children experience an exhibition just for them. 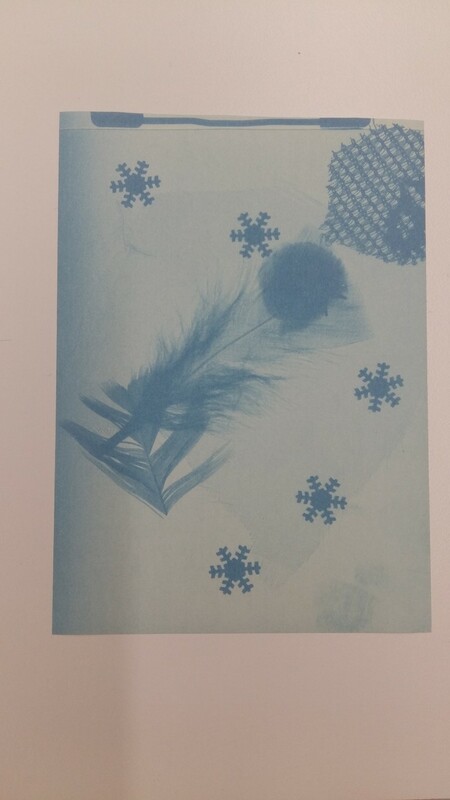 These holidays the Gallery had a treasure hunt activity. What I like about the set up was they had a section for children under 3 too so there was less risk of babies chocking on the gems. 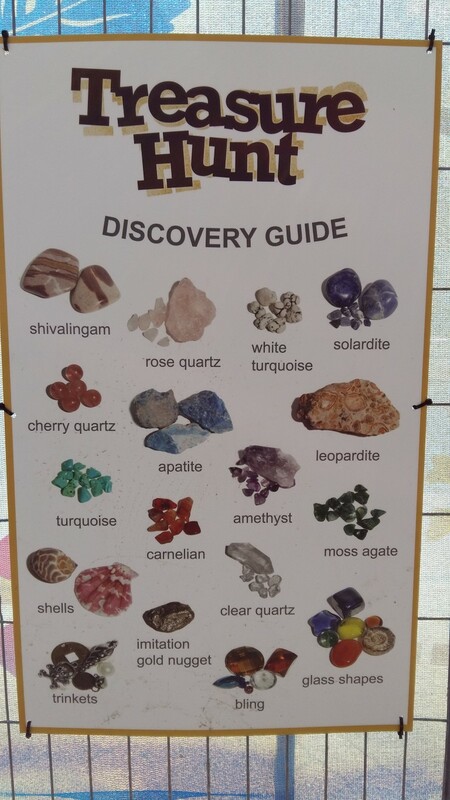 The idea was for children to fossick for the 'treasures' and to have a geology experience. 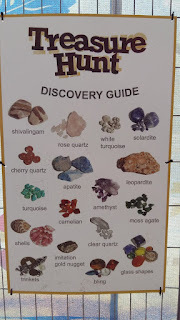 There was a chart too for children to check what they had found after they used the sieve to separate the sand from the gems. Children were also able to decorate their bags using stamps and ink. Upstairs in the Gallery was another children's activity/exhibition called "Imagine this..." where children had the stimulus of artworks from the collection to respond to and create something inspired by the artworks. As you can see in the imagine below is an artwork by Eddy Parritt called Giant remote viewing (2003) made from Wood, steel and mixed media. 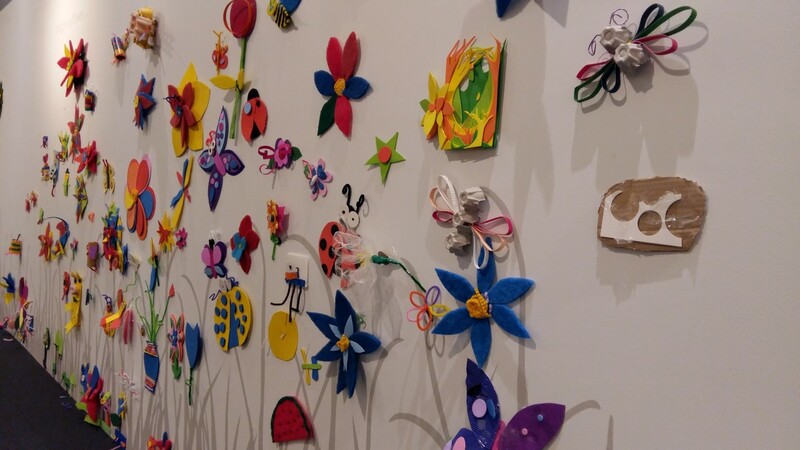 On the wall are the results of the creations the children have made. What is great about most forms of printmaking is it is an extension of drawing. And this is true for foam printing. I have purchased a pack of 10 A4 art Styrofoam sheets and divided into A5. Get the child to draw their image using a pen (not pencil as it is too sharp), making sure they have press in hard enough to leave an indent -adult to check prior to printing. Get child to flip face down on paper and pat/or smooth over. 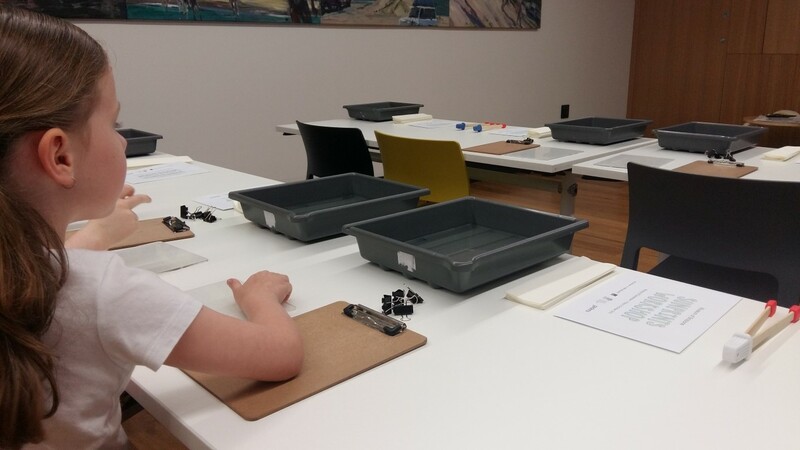 What better way to introduce children to objects of our past and human history than through an art and archaeology museum school holiday program. Just 40mins north of Brisbane, Queensland, Australia is a wonderful museum with a generous size collection of artifacts on display. The museum is set out in a logical order -a timeline of history. It can be walked through (if reading the didactic and information panels) between 30-60mins. But that is more for the adults than the kids. However, there are some lovely murals painted on the walks which document a visual representation of times past which the kids would enjoy looking at. 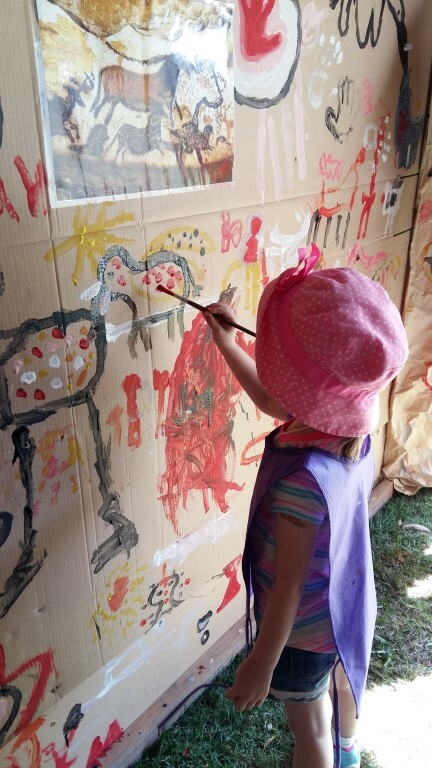 Overall this has been one of the best kids programs I have experienced yet, but, as my child gets older, she is able to participate in more things. 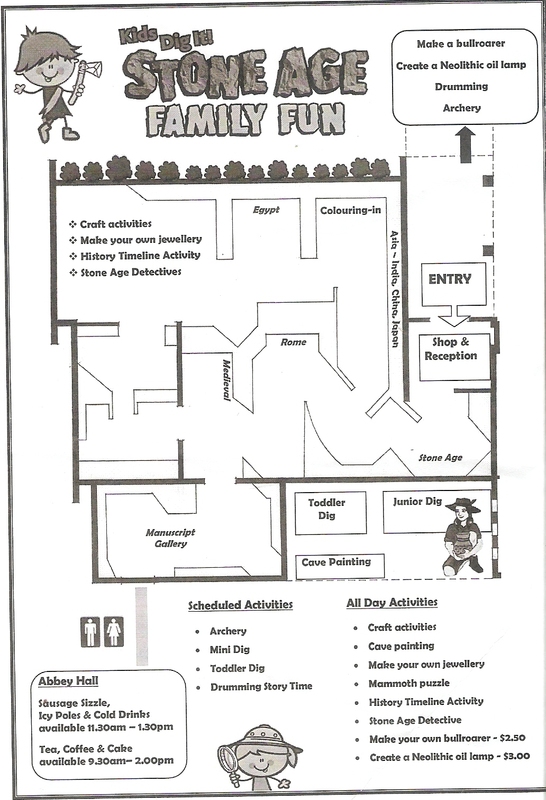 Check out The Abbey Museum for their school holiday program. 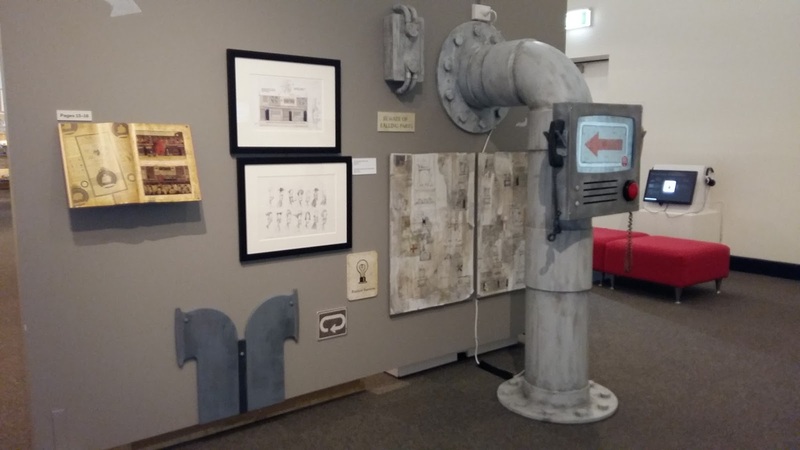 I had the opportunity to visit a nearby (30mins away from Brisbane) local gallery, Redcliffe Art Gallery to view the Shaun Tan exhibition based on his children's book "The Lost Thing". Immediately walking into the Gallery I LOVED the set up. I could tell straight away thought had gone into the layout of the exhibition, to make it exciting for children. 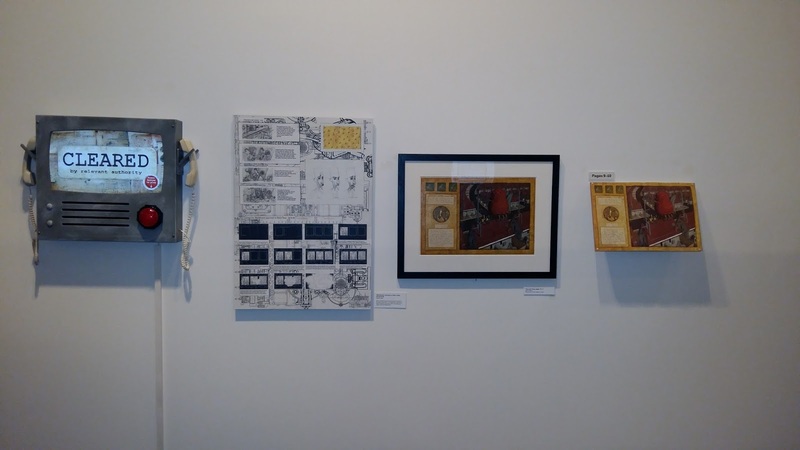 The exhibition was a collection of; original artworks, a few sculptures and documentary segments on how they turned the book into a short 15min film. 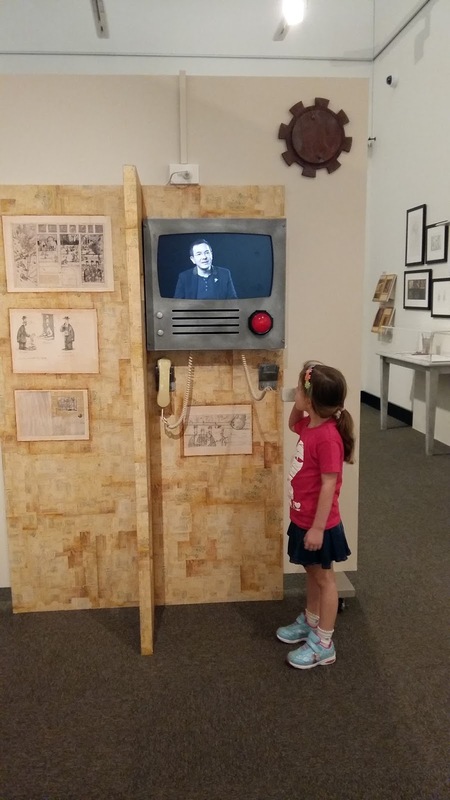 How the curator displayed the film clips was imaginative. All the exhibition was themed to look like the book. So the films were display on screens which were encased in a fictional looking TV Box. The engaging part for participates was that they had to pick up an old retro telephone handset to listen to the audio. This was a great idea as there were a number of film clips that could play at once and this meant it did not disrupt the experience of others. Also, to play the video, the children had to press a red button which was a symbol used in the book. I loved how every page of the book was laid out in order and on view with some of the accompanying artworks. Props associated with the exhibition really gave the sense of the space being not only transformed but incorporated, for example, the fake pipes attached to the wall. Other fixtures included display cases masqueraded as a sense from the book, or protruding walls with window holes. Another feature was a large open 'pipe' which had sounds playing so children could go and put their ear to the piece. All in all a very engaging (though small) exhibition, it wad just right with number of artworks. That was another aspect, to the interesting design and layout of the exhibition. The artworks were arranged deliberately to be bunched together in asymmetrical format. 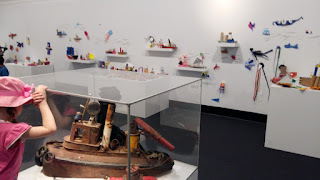 The only criticism I have, which is not solely related to this exhibition is the blurred line between what children could touch and not touch. General Gallery etiquette is that you don't touch the artwork. And this would still be true for those things framed and on the wall, however it was unclear for the 'props' where something we could touch. Small issue but nonetheless I have found this uncertainty among other children focused exhibitions. 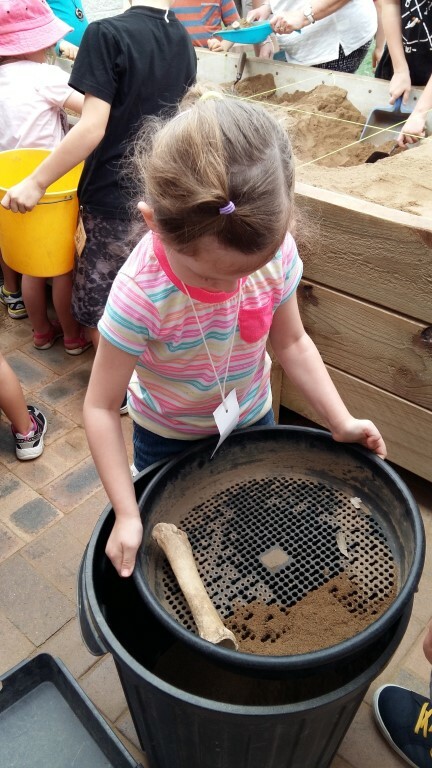 Whenever I choose an experience or event to attend, I always consider what is there for kids to do. I hate going to something, designed for children, that lacks adequate audience engagement. With my desire to persue a role in Public Programs, and possibly a Masters of Art Education in my future, I thought critiquing and reviewing my experiences would be a wise record to start. 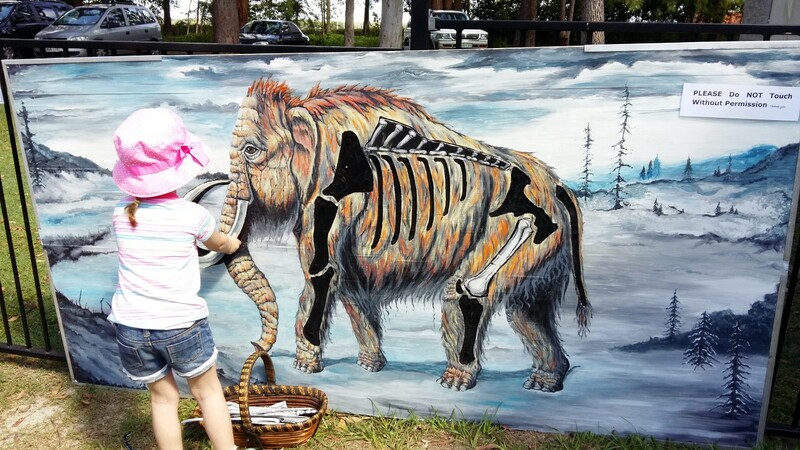 So, this post is my first official published review, though surprisingly not of a gallery or museum exhibit, but of an educational experience at a zoo. I was excited probably more than Miss 5 to be going to not just any zoo but the Australia Zoo. Having experienced a few different zoos BC (Before Child), the Australia Zoo is quiet large and impressive in the animals they show. (Also from an Artist point of view you are always on the look out for source material, and as I am a painter of animals and birds, I was especially mindful of an opportunistic photo). Bindi's Treehouse -This was a disappointment. Considering this was the drawcard for coming during the holidays as advertised on TV, there was nothing for the kids to actually do. There were two bad telescopes which were not easily reached by children as there were no steps, and nothing to do at the treehouse. There is definitely room for improving this experience. Park Sculptures -Throughout the zoo there were bronze sculptures which acted as photo attractions and 'play' equipment for children. 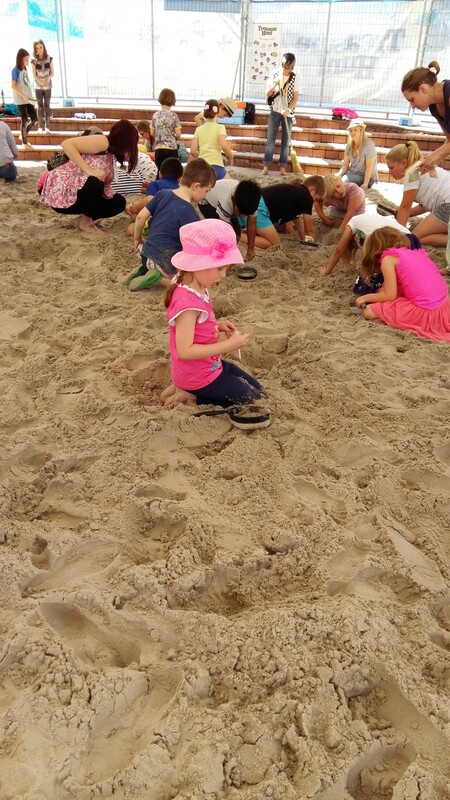 At one of the sculpture areas was a fossil dig. 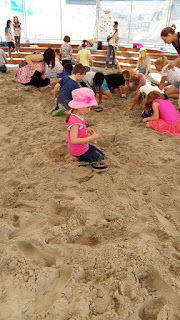 This is such as great idea, however it was not undercover, so on the day I attended it was wet sand and the interaction with this space was not an option, as well, there was no tools for children to use to dig. Rides -There were some rides throughout the park of jumping castles, and the spinning teacups, as well as those pay your $2 to ride on those things you see in shopping centres. Rides are ok and good to break up the day for the kids, however for us, we had to explain to Miss 5 we came to the zoo to see the ANIMALS not to go on rides. Public Programs: Live Talks and Demonstrations -These were very educational, and great to listen to as an adult though not targeted at children. Older children would have listened and picked up on things. Even posing questions to the audience ie children would make a difference in better engaging them. Animal Encounters -Photographs with the Animals & Touching the Animals -This is another consideration for engagement in terms of physical interaction and tactile experience. What about a colouring in station or something with chalk like a communal wall. These suggested improvements do not have to be from an educational perspective rather increasing the fun and overall engagement, learning and interactivity experience. I am a contemporary acrylic impressionistic painter inspired my surroundings. I paint bold and vibrant landscapes, animals and still lifes often using texture to emphasis feature. I am currently living in Brisbane, Australia. This website, ©Arty Crafty Studio, 2010 - 2015, and its content is copyright of © Chrissy Dwyer, or otherwise attributed to its original sourced owner. Images owned* by Arty Crafty Studio are allowed to be copied, reproduced, modified or distributed with accreditation i.e. Source: Arty Crafty Studio. (*Any images linked to this website not owned by Arty Crafty Studio has been attributed to its source. Arty Crafty Studio does not claim ownership or copyright rights over these images). Information (text and content) on this site is for general information and educational purposes only, for private use only and is not to be distributed for commercial use. Information is provided in good faith to be correct at the time of posting and the website owner takes no responsibility for its accuracy and reliability of the source. Information shared is the Intellectual Property of and opinions, ideas, thoughts and general knowledge of Arty Crafty Studio and/or Chrissy Dwyer, unless stated otherwise.